Join us as we celebrate our 94th year of service to the Duluth community. Bring a friend, enjoy conversation, scrumptious chocolate desserts, wine or coffee. You don't have to be a member to join the fun! The Duluth Curling Club Lounge, is on the second floor of the DECC. Enter the DECC parking lot near the William A. Irving boat. 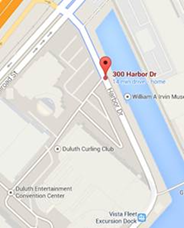 The Club is located directly across from the parking ramp. Enter the Club through DOOR A around the corner. The double doors on city side will be LOCKED (see dot center of map). There are two way to access the Curling Club Lounge. 2. Enter directly from the 2nd floor skywalk level either parking in the ramp or walking from downtown. An elevator is located in the ramp on the northeast corner, exit closest to Rail Road Street. IF the DECC is committed to collecting a parking fee that evening (unpredictable for us) we are happy to give you a ticket for a beverage of your choice in trade for your DECC parking pass.